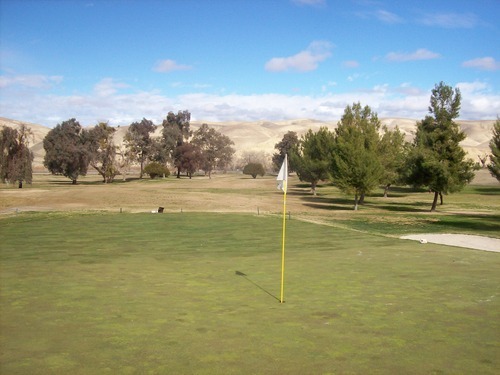 Though Kern County doesn’t have a ton of golf courses compared to other parts of Southern California, I still had to check what I could off the list. By my count, there are actually more private and/or military-only regulation courses in the county than there are public ones. 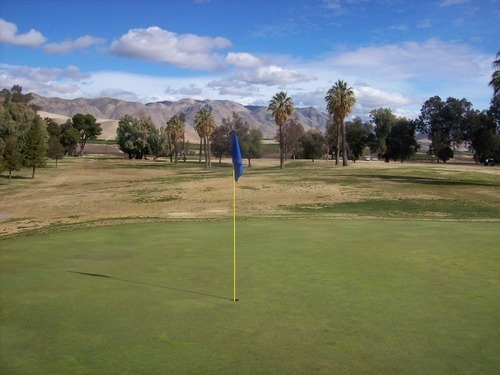 Also, one that was on my original list (Valley Rose in Wasco) closed before I had a chance to play it and I’m not sure if there are any plans to reopen it. 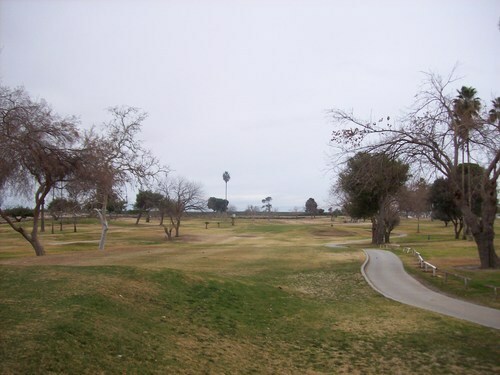 I think of all the courses on my entire Southern California list, this was the one I was least looking forward to. 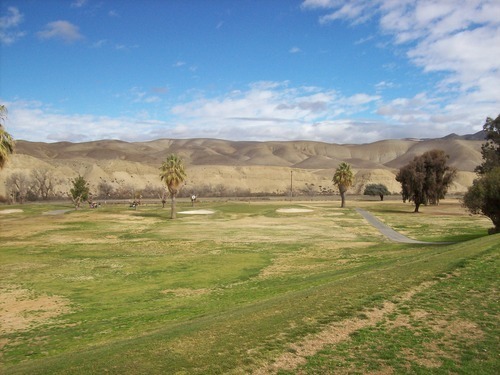 Not only is Bakersfield a little more out of the way than usual for me, I knew the course itself wasn’t supposed to be anything special. Add to that an expectation for poor winter conditions, and I had to push a little harder than normal to be up and in the parking lot before the crack of dawn. But there I was around 6:00, in the dark and ready to go. There were a few cars (I mean pick-up trucks) in the lot, so I went up to the pro shop and they were already open. I checked in as a single and they put me in the first group out with three course regulars. By “regulars” what I mean is three guys who play here every Saturday morning as one of the first groups out. Ultimately, that turned out to be the one saving grace of my North Kern experience. The price was $48.50 with a cart, though this would be an easy walking course as it’s very flat. 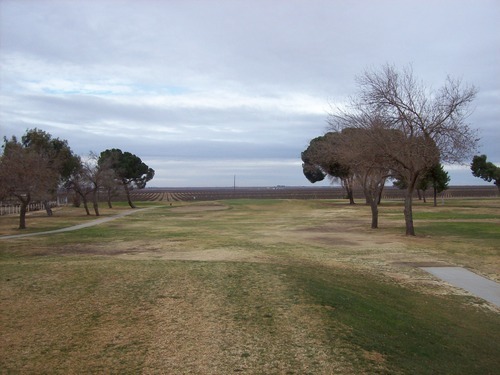 When I met up with my partners by the first tee and waited for just enough daylight to start playing, they gave me the option to go ahead and play by myself ahead of them. Normally, I might do that just to get around as quickly as possible, but I’m glad I didn’t. One of the guys goaded me into joining their usual Saturday morning money games. The stakes were very low and they had the home course advantage, but I went ahead with it just for fun. In the end it cost me an extra $10 in bets, though I wasn’t far off at all from some money coming my way. Oh well, it made things much more interesting on an otherwise uninteresting course. The conditions were poor and the weather was gloomy. The cloud cover early on made the dawn temperatures surprisingly temperate for most of the front nine, but then the winds picked up and the sky got darker and darker, so by the time we finished it was blustery and brutal. There really isn’t that much to note about the course itself. 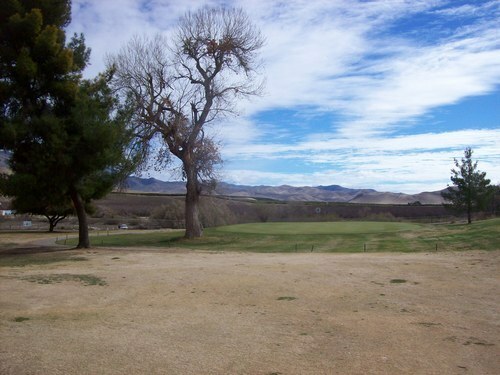 It has some similarities to Buena Vista, which I played in December, but that offered a lot more variety. 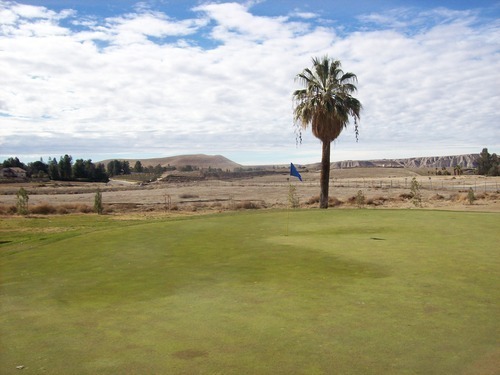 This course is pretty straightforward with holes running back and forth, packed within a relatively small property next to some farmland and some sort of correctional facility. The fairways are lined with a smattering of trees, but the landing areas are quite generous on most holes. 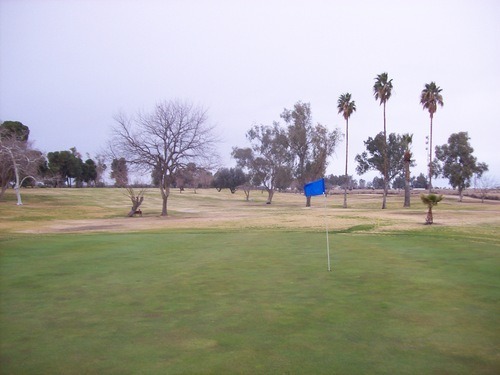 The greens are medium-sized and feature some sloping that can be tricky to read for a first-time player. 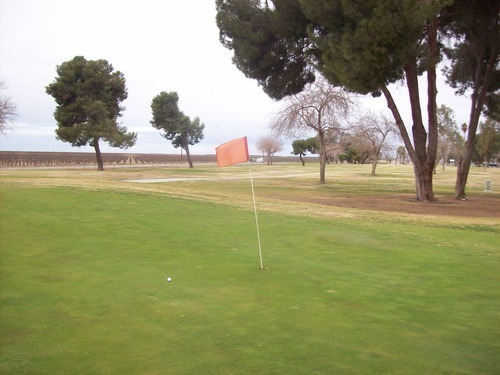 I got into a habit of missing the greens in the worst-possible places, leaving awkward chip shots and difficult up-and-down angles. 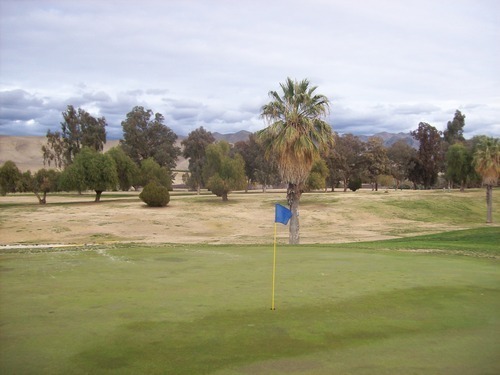 Once on the greens, I held my own despite not knowing the subtle, yet inconsistent, valley breaks. 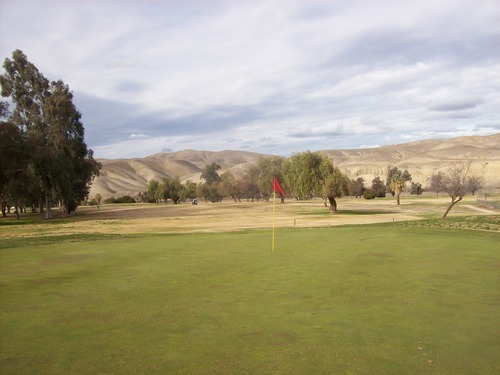 As I had expected with the dry and cold winter temperatures they’ve had, everything was pretty much brown, dormant and thin from tee to green. It was not too pretty and the gloomy skies didn’t help as you’ll see in the pictures. 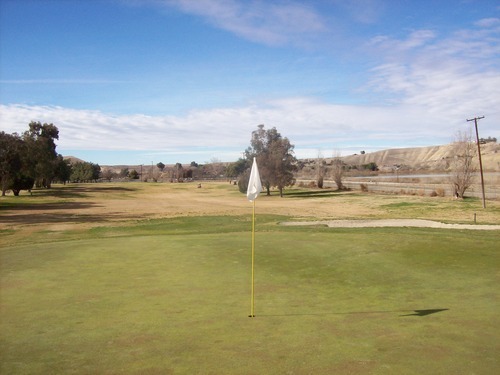 The greens were reasonably soft and receptive and pretty quick on putts. I noticed a few bad areas here and there, but mostly fine. The guys I played with said the course has some of the worst bunkers around, but the ones I found were actually decent. Even in its best shape (usually in spring, according to my playing partners), this course is not meant to “wow” you on any level. 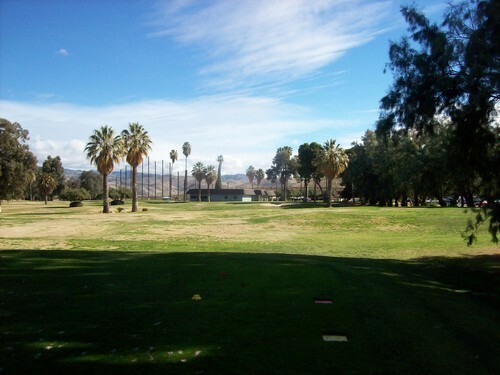 It’s a locals’ course with a lot of friendly regulars around the clubhouse, and they made me feel pretty welcome as an outsider visiting from Orange County. This is one of those places where it’s about the camaraderie and local traditions more than the course itself. I can appreciate that, but the only reason I might ever play here again is to try and join up with the same guys and win some of my money back! It’s actually quite a jaunt out to this course that’s about 20 minutes east of town off of the 178 highway. I knew very little about it going in, but had hopes that it might be a pleasant surprise. On most levels it was. I checked in a little before 11:00 and was teeing off with another single around 11:10 after grabbing a quick bite in the clubhouse. I had a tasty foot-long hotdog, big bag of chips and Gatorade for a reasonable price of $6.50, and the ladies working the counter were super nice. The golf was $49 with cart. Though it was easy getting started, the course was actually quite crowded. The weather in this area was amazingly better than what I had over at North Kern. 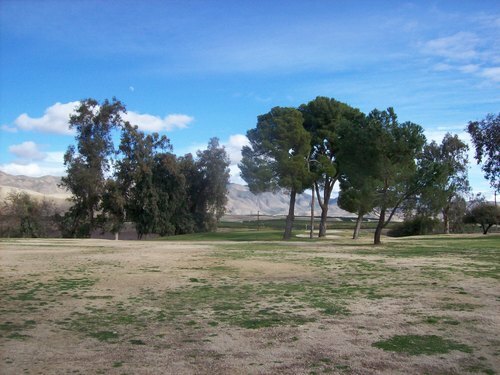 It was a beautiful afternoon at Kern River Golf Course. We had to wait on every shot and it seemed like really slow going, yet the total 4.5-hour pace wasn’t really too bad for a busy Saturday. The star of this course might be the setting itself. 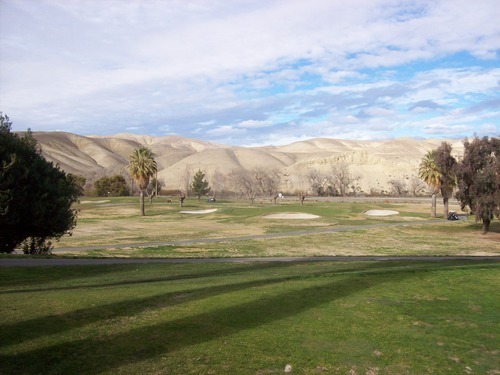 It’s definitely one of the more scenic options in Kern County (which is not saying much). On the way out to the course, you go by some nice homes and newer developments, but the course itself appears to have been there for awhile. 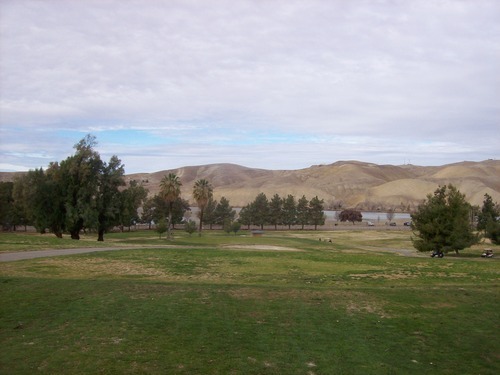 The course is nestled next to the Kern River and the Lake Ming recreation area. 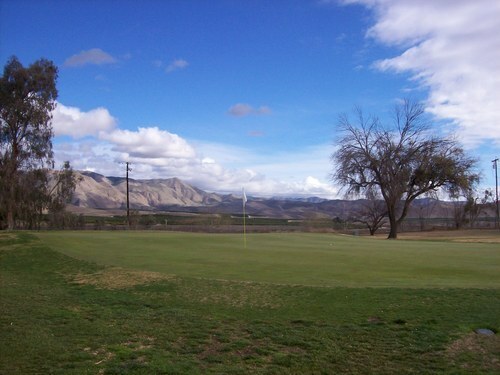 The mountains on the other side of the river provide a great backdrop throughout much of the course. The course itself also offers a much more interesting design than I expected. It’s relatively hilly with a lot of natural undulation that the designers used to add contour and challenge. Many of the greens are slightly elevated and well-protected by mounds and bunkers. 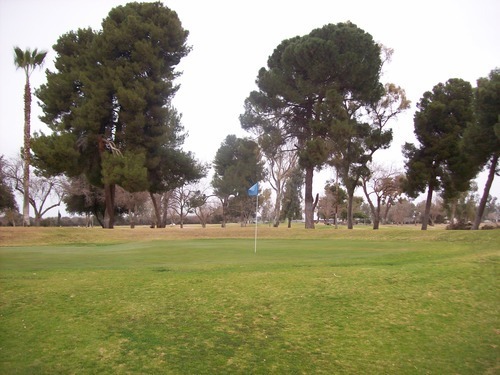 Trees line all the fairways (some narrow, some very wide open) and there are a number of tricky doglegs, so positioning off the tee is crucial for a good score. 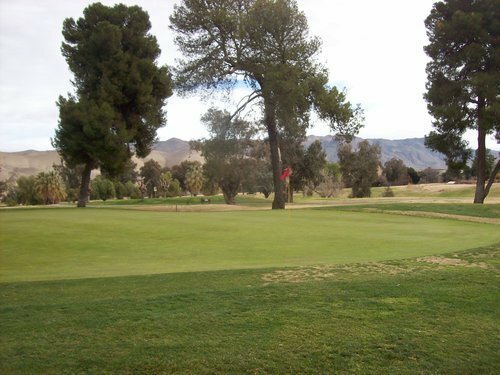 The medium-sized greens feature some tricky slopes and undulation, but nothing too crazy. The first two par-3s on the front (numbers 2 and 6) are nice with elevated tees and views of the recreation area behind. The most fun hole, though, is the short par-4 5th that plays 293 yards from the blues and 282 from the whites. 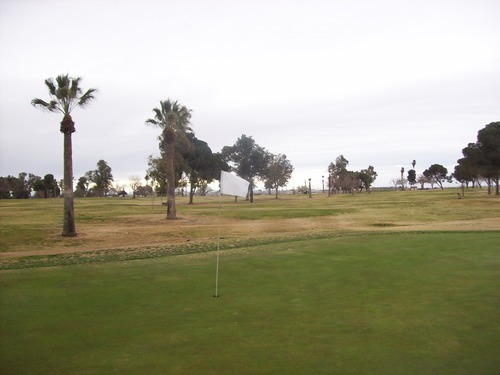 Long hitters can go for it, but the green is not easily accessible. 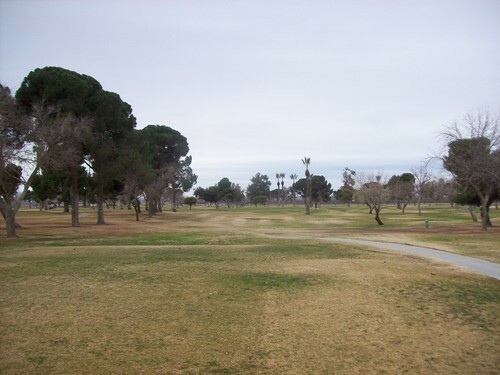 It is perched up and the fairway slopes severely from left to right, so anything short and/or right will feed down into a tricky recovery area. 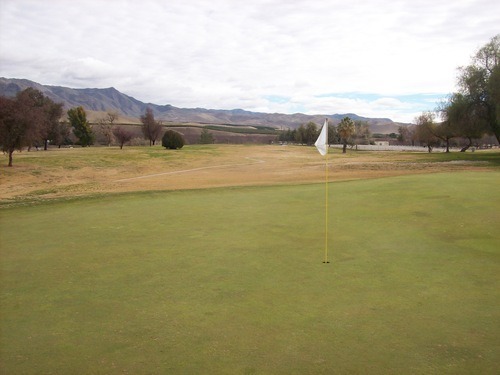 Left is your miss here because you might get lucky and feed down to the green that also slopes a lot from left to right. 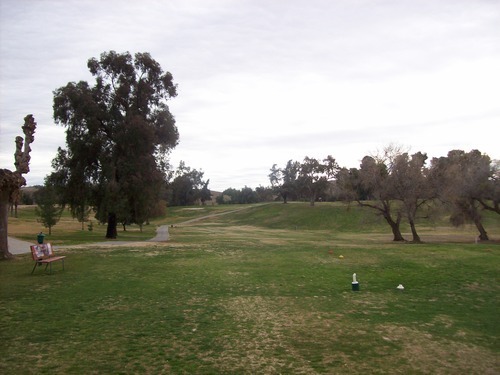 Unfortunately, this course was also in pretty “ugly” winter condition. It was mostly dormant, brown and patchy throughout. However, it was not mown as tightly or consistently as North Kern. On one hand, that meant a little more cushion on most fairway and rough areas, which was nice when you had a clean lie. On the other hand, it also meant some more clumpiness where a ball might settle next to or between tufts of different grasses. The greens were decent, but a little bumpy at times and worse as the day went on. Both bunkers I found were quite good. The tee boxes were mostly very good. The greenest parts of the course were around the greens and on tee boxes, so it’s clear any watering they are doing now is focused on those areas. I wish this course wasn’t so out of the way because it is one I’d like to visit in springtime. 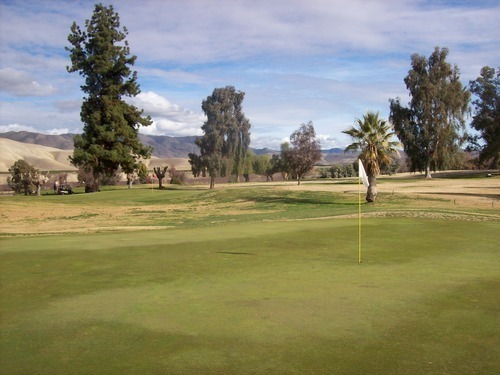 I’m not sure how good conditions ever get, but if the course were lush and green it would be a borderline “hidden gem” in an area where options are very limited.